"Bhutan? Isn’t that the place they call the last Shangri La?" “Bhutan? Isn’t it that kingdom frozen in the medieval ages?” The outside world’s reactions to Bhutan tend to swing between two extremes – it is perceived either as a paradise on earth or as a country completely isolated from the rest of the world and trapped in a time warp. Neither image is true. 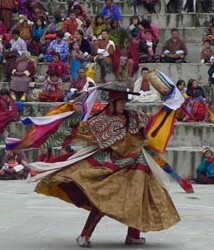 But it is true that Bhutan is like no other place in the world. Its spectacular natural beauty and pristine environment, it’s fabulous architecture and living spiritual culture, and its wise king whose unique philosophy of governance measures the countries progress and development not by its gross domestic product (GDP) but its gross national happiness (GNH) – this is the stuff of which legends, and romantic flights of fancy, are born. Her Majesty the Queen of Bhutan Ashi Dorji Wangmo Wangchuk "A Portrait of Bhutan. Maybe my favorite day was the one spent trekking in The Valley of the Cranes and the visit to the local home. But everyday was great in it's own way. We had one traveler who is a devout Buddhist and who suffered a stroke more than 20 years ago. For him visiting the temple at the Tiger's Nest was a life-long dream as a pilgrimage. Watching him make it up and back was an inspiration to everyone in the group and a life time memory. We can't laud Bill Jones enough. His enthusiasm for Bhutan and the depth of knowledge greatly enhanced our experience. The interplay between Bill and Tsewang Rinchen was wonderful - each gave us a slightly different perspective while conveying their great passion for Bhutan, its culture and people. Copyright © 2019 BillJones.Travel. Powered by WordPress. Theme: Spacious by ThemeGrill.